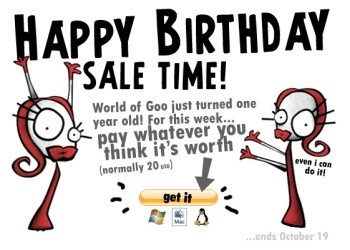 It's birthday time for World of Goo and to celebrate, the folks at 2D Boy are having a special sale: This week only, you can buy the game for whatever price you want. World of Goo was widely hailed as one of the finest games of 2008 and with good reason: It's funny, challenging, looks great, sounds better and is almost viciously original. At $20, it was also quite cheap, especially given the piles of gameplay it brought to the table. Now, for those unfortunates out there who still haven't discovered the warm, squishy glory of the Goo ball, the developers are making it even cheaper. How much cheaper, you ask? That's entirely up to you! All three versions of World of Goo - Windows, Mac and Linux - are on sale until October 19 for "whatever you think it's worth." And by all appearances, they mean that quite literally: The "Get It" link at 2dboy.com delivers you to PayPal, where the price of the game is nothing but a blank field and the freedom to do with it as you please. Let me take this moment to encourage you to throw some cash at the 2D Boys. The sale is a great way to score some cheap World of Goo, sure, but if you've got a few extra bucks lying around, don't be afraid to pay the regular price for the game, or even more than that if you're the wealthy, philanthropical type. It's a great game and 2D Boy is the kind of studio we should all want to see more of.